I found the recipe for Easter Nests in my April 1943 Westinghouse Health-for-Victory cookbook. I've been saving this one until Easter came around (of course!). I was so excited to finally get to try it. 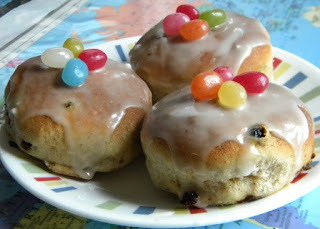 What interested me, besides the cute name, was the glazed Hot Cross Buns with jelly beans on top. It just sounded so fun to eat, and I knew my kids would love it too. I've been sitting in bed resting after a nasty case of stomach flu and was finally able to take more pictures of some of my vintage cookbooks and pamphlets. So thrilling! In this post, I showcase one cookbook and two fun pamphlets. Oh man, that title! 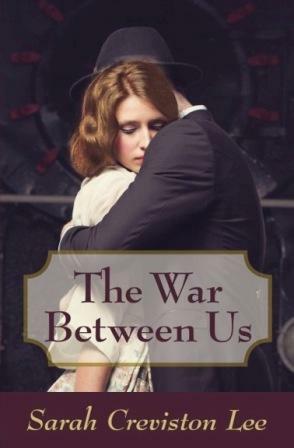 And the cover illustration. Oh boy. haha! This cookbook really caught my eye, and I actually had the choice between two different editions - 1938 or 1945. I didn't see anything particularly wartime-related in the 1945, so I went for the earlier one because of all the lovely hand-written recipes in the end pages. The cover was also all grimy, but it's the kind with a shiny shellac kind of surface to it, so I cleaned it and it looks and feels much better! Since embarking on my ration project in 2014, I started collecting wartime cookbooks and pamphlets. I have found some real treasures along the way! I wanted to share with you some of my recent acquisitions. They're not all wartime cookbooks but are still a lot of fun. 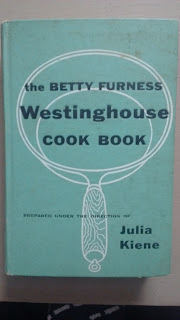 I was interested in this book because I have so many of the Westinghouse Health-for-Victory cook book pamphlets. It's quite a few years after the war, but I was curious to see how many recipes from the wartime pamphlets made their way to this book. I got this cookbook from my friend, Mairi. I love the look. It's classic early 1930s. Cookbooks like this are important when looking at wartime cooking, because books like this would have been sitting on women's shelves and would have, no doubt, been used and still have been part of their cooking repertoire. This cook book put out by Mirro, an aluminum company, also falls into the pre-war category. They were well known for their cookie cutters and pans. 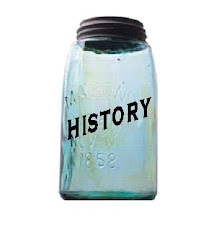 Welcome back to Part 2 of the Indiana Historical Society Museum! I wanted to start off with this photo of the beautiful main lobby. I love those giant pocket watches hanging down. It's a great tie-in to the "You Are There" exhibit theme. Now this is the exhibit that I got all giddy about. I really couldn't wait to share it with you! This exhibit talks about what conservation and preservation are, why they're important, and how it's done. I can't begin to tell you how much I loved this exhibit. This is one of those "behind the scenes" type of things that you usually don't get to see in museums, but this exhibit throws open the doors and tells you how it's done. Just completely awesome with a capital A!